This seems to be the tier 8.5 or 9 set that comes with patch 3.1. By the stats, it looks really nice, and the set bonuses are beneficial to both affliction and destruction (don't know if it's good for demonology though). Those sockets are ok. I would definately want this for my warlock, though I don't know if it's the BEST for warlocks (haven't looked through all the items), but it's definately an upgrade from the 3.0-3.0.9. Don't know how the looks of this thing is, so if you want gear just because it's cool, you'll have to either get it, link it and ctrl-click it (don't know if this will work before the patch comes online), or check for some pics/videos on the internet, unless someone posts some pictures here. Looks kind of like a raven's head, which makes it all the more perfect for Warlocks. In some cultures (most notably European nations during the Middle Ages, when all sorts of bulls*** beliefs about the supernatural were common (like the "Let's dunk you in water to see if you're a witch; if you don't drown, you are one and we're gonna burn you alive" crap), although some nations still have folklore depicting ravens as ill omens), the raven is considered to be an omen of evil and/or death, mainly due to their call, black feathers, and diet (mainly carrion (rotten meat on the corpse of an animal)). Considering that Warlocks are typically associated with evil and death, the raven-like appearance of the hood fits. looks like those funky bird things in the Dark Crystal movie. im seriously disappointed with the blue socket. As an undead shadow priest, I'm pretty jealous that I don't get the chance to look like Putress. I would be more okay with that fact if our tier 8 helm was class specific, but there are two non-tier cloth helms that copy priest tier 8. There's also non-tier cloth helms that look like the mage tier 8 as well. What makes warlocks so special? The helm gives off a black aura, very similar to the Plagueheart Shoulderpads. It's also incredibly annoying when you're in flight! Quite a weak item if I may say so. From T7.5 to T8.5 you lose 56 haste and 9 spirit. Sure- you gain 86 crit, but crit is one of the least desirable stats for Warlocks. 1 Crit rating to a Warlock is worth anywhere between 0.5 and 0.8 haste rating, if we'd convert that 86 crit to what it's dps equivilant in haste would be we'd end up around 60 haste, roughly what we lost. What's left? A slight spellpower gain. Having done the math using Elitist Jerks panel of weighted stats, for a 0/13/58 spec, this helm is worth 391.5 (that is including matching sockets. Using a runed scarlet ruby instead of a twilight opal would net you about .9 more). Compare that to the Tier 7.5 helm, which is worth 361.9 (once again with matching sockets). That's an 8.18% increase in valuable stats, whereas the ilevel only increased 6.1%. While theoretically having a helm that just had 250 straight spell power would be better than this, you take what you get. Also, the tier bonuses for the 8.5 set is much, much nicer than the tier bonuses for 7.5 were. I am moderately upset that there are no hoods that look like this helm that aren't part of the Warlock tier sets. Saw this on a female gnome lock today, that was a whole new degree of creepy. Just to reply to myself, the premade gnome female warlock on the 3.2 PTR comes with this helm (well and the rest of the set of course) if anyone wanted to check it out on a moving character. Trivia: I find the design of the hood awesome. 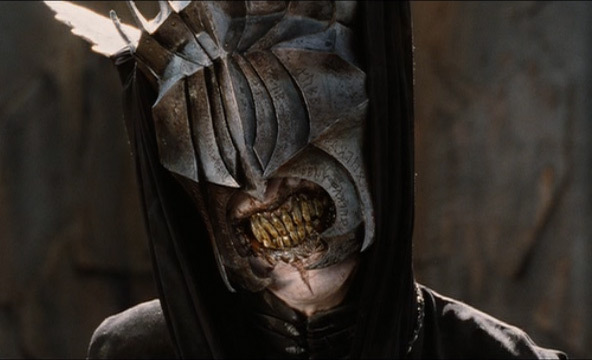 In my opinion, it looks like an adaptation from the character featured in Lord of the Rings, Mouth of Sauron. This is a very good head piece... Now that Emblems of Conquest are available from Heroic Dungeons it makes it a little easier to acquire except for the token price... Would require time but it can be done... Did I mention how hot it looks? Since no one else has posted this info before I thought I should. The masks being referred to in LucienLachance's post are masks called "Medico Della Peste" masks or "Plague Doctor" masks. They were created by a French physician named Charles de Lorme. Doctors wearing the masks would also wear black cloaks and hats and often carried a cane used to to poke/prod/examine or move the bodies without direct contact of the affected individual. First time I saw this hood this was exactly what came to mind. "Medico Della Peste"
I still think of Silent Hill every time I see this mask. This set is to this date my favorite lock set. 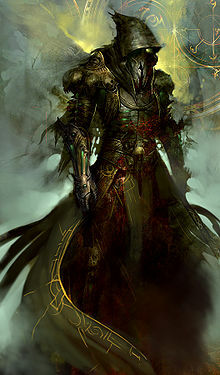 Isn't the undead named Putress that appears in the scene: ''Wrathgate'', wearing this helmet/hat? (2) Set : Increases the damage done by your Unstable Affliction by 20%, Hand of Gul'dan damage by 20%, and your Immolate by 10%. (4) Set : Increases the critical strike chance of your Shadow Bolt, Drain Soul and Incinerate spells by 5%.